Now more than ever, this quote couldn’t be more relevant, especially when you listen to the new video message Anonymous has just released. It’s almost unfathomable just how much progress humanity has made in terms of waking up to the lies and deceit that have plagued this planet for a very long time. We’ve seen as deception has affected several different areas like health, education, finance, religion and more. For someone like me, who’s been working in this this field for several years, it’s been easy to see, and there are multiple examples. Perhaps the best one would be 9/11, an event we were told was a terrorist attack, but 16 years later, a large majority of the American people do not believe the official story their government has told them, simply because over the years a lot of evidence has surfaced showing some funny business. We covered this in depth in our latest documentary. Unfortunately, this type of deceit has created Islamaphobia, fear of another religion based on completely false premises. Today, so much is constantly surfacing allowing the masses with the opportunity to see, and once we see, we can begin changing our human experience. Thanks to the fact that people are waking up, it’s not as hard to see that sometimes events are created by governments in order to blame a country, person or group for the purpose of providing justification for invading another country for ulterior motives under the guise of ‘terrorism.’ These aren’t just words, there is a mountain of evidence to support these kinds of claims, and we’ve written about it multiple times in great detail. It’s called false flag terrorism, and it has happened ON numerous occasions. One of the most recent examples we wrote about was about the PR firm Bell Pottinger, well-known for having many controversial clients, they worked with the U.S. military to create propaganda in a secretive operation. These guys were paid half a billion dollars to create fake terrorist videos for the western military alliance. Not only has this type of thing been expressed by anonymous, but from people inside the power structure, as well as various documents and other leaks that have come out over the years. You can see a few examples HERE. The only issue is, many do not consider these revelations to be real. No matter where or who they come from, unless it is presented on mainstream television people often simply dismiss it. 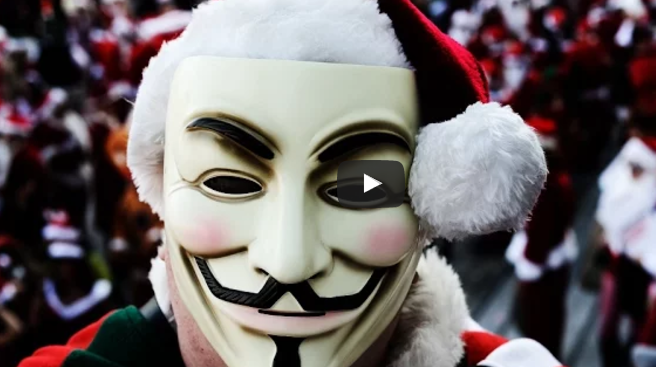 But this message from anonymous is not solely about false flag terrorism, it’s about the entire human experience and the “culture they have created to take any real notice or make any real change.” It’s about recognizing that we don’t live in a democracy, that every day our rights are being taken away, that steps are being put in place to censor and silence information. The most recent example would be Facebook and mainstream media deciding what fake news is, instead of allowing people to examine sources and decide for themselves. As the video below points out, most of our lives are indeed a lie, and it’s hard for many to accept this or even accept it as a possibility. That’s why bringing this topic up, or talking about it to someone who is unaware of this type of information can spark a harsh response. Many people within the “consciousness” movement like to point to the idea that anonymous creates an ‘us vs them’ type of ideology, but I don’t feel this way. They are simply exposing what we’ve been blinded to for years, that those who we call our ‘leaders’ and claim to have our best interests at hand, actually don’t. And yes, whoever they are, it’s important to expose them, because we cannot transform our world until we see it for what it really is. Some great examples come from Wikileaks, and the corruption that plagues the American political system. Information is a great tool to help shift the consciousness of people. Information that we were once not aware of, new revelations and more can completely shift the perception of the masses with regards to what the human experience is really about. It’s an ‘ah ha’ type of moment, an ‘Earth is not flat’ type of moment. New information and revelations of truth are one important catalyst to creating a shift in consciousness within the individual and, at the end of the day, the number one thing that will transform our planet is the transformation of the people on it. Our thoughts, feelings, perceptions and emotions alone have the power to transform what we call our physical material world, but that’s another topic entirely. “We exist in an important time in humanity’s history where if we realize the WE that we truly are, we can shift ourselves enough to move out from under the tyranny of a global elite that has existed for decades. So I urge you, see through the battles the media is trying to create, see each other as fellow souls, humans on this journey and focus on what we can do to create a better future vs fighting.